Prashar lake I visited if I remember correctly five years ago. Which month I do not remember but it was festival time and heavy rains. I ran to watch holy lake and then to reach the temple to offer prayers and back to Mandi town (48 km approx.) via hired vehicle. Since then the wish was to visit again and if possible during festival time. Accommodation search was done. Homestay preferred at Nandli village – approx 18 from Mandi town situated at Mandi – Prashar road. 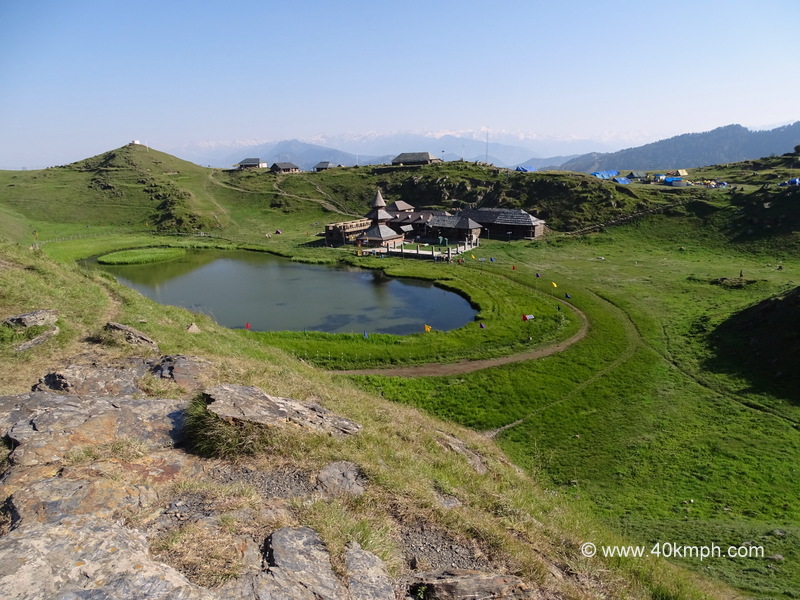 Prashar lake is further 30 km. Yes, I was riding solo via Royal Enfield Thunderbird Twinspark motorbike. I started journey from Naina Devi temple, Bilaspur reached Nandli village in 6 hours total journey time covering 158 km. But you do not worry. How to reach Prashar lake from Mandi town if you do not have your own vehicle? Bus service is available now-a-days from Mandi town bus depot for Prashar lake early in the morning between 7:00 – 8:00 am. It might be 2:30 – 3 hours journey. This bus same day return in the afternoon hours. If the only bus is missed then another bus for Kandalu village and then 10-12 km of trekking Or, bus for Bagi village and then you have to hire jeep from Bagi village (even from Kandalu village) for Prashar Lake. Upon query I was told by the owner of Sri Prashar Home Stay, jeep hiring charges maybe Rs. 2000 from Mandi town to Prashar Lake to and fro Or, you may reach Kandalu village by bus and then hire jeep. I started journey by Royal Enfield Thunderbird Twinspark motorbike from Nandli village with Manoj – caretaker of Homestay at 4:30 am reached Prashar lake at 6:15 am – 30 km approx. 2 hours journey because of last 20 km not so good road condition though after crossing Nandli village road construction work was going on. It was a festival time thus devotees in large number going towards Prashar lake via hire or own jeep or walking. During festival time devotees carry Shuka Dev deity from Thatta village to Prashar lake. Various villagers also carry deities and Rath Yatra from their individual villages. Lots of tents and makeshift shops are made by devotees. One may stay at temple dharamshala or place ones own individual tent or may book forest rest house in-advance. In-short festival is the best time to visit if you want to watch and to know tradition and culture. I thank God I had an opportunity to re-visit Prashar lake again during festival time. I wish to visit again to visit nearby temples – one is nearby and other inside the jungle.